Last week when I was talking with a Chicago Tribune reporter who was supposedly doing a profile on one of the Chicago Teachers Union leaders who also reported for Substance, I had to warn the guy that red baiting, racism, and other nonsense was in the DNA of the Chicago Tribune — and had been long before Sam Zell bought the paper and destroyed it even further. "If you make that mistake," I told him, "We'll give you the Ron Koziol Award and then treat you like a scab, like John Kass is." Harry Truman, who had just won the election of 1948, holds up the most famous front page in the history of mendacious fantasies of the Chicago Tribune. The Tribune's fierce racist, union busting and anti-communist editorial policies and biases seeped into every news story for more than 100 years, and continue in 2012 with the salvos against the Chicago Teachers Union, including the September 16 story that tries to claim the latest lie about the CPS "deficit" is a fact.Ron Koziol was the Trib reporter who took his "news" directly from J. Edgar Hoover of the FBI to slime Martin Luther King Jr. and other leaders of the Civil Rights and Anti-War movements of the 1960s. But the real fun, in reading the Trib's back issues, is to be found in the relentless, decade after decade racism of the newspaper that had helped Abraham Lincoln win the Civil War. That part of the Tribune's history was firmly in place long before Koziol and the Trib's editors took a lurid interest in J. Edgar Hoover's version of Martin Luther King's life. 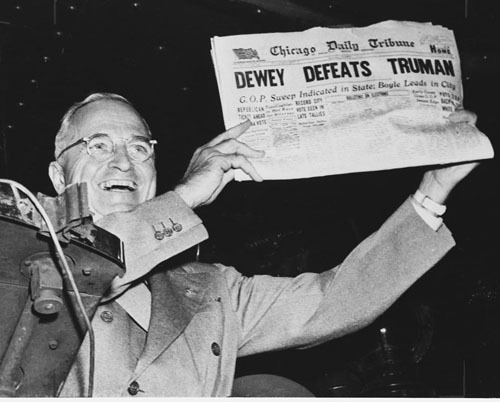 The best, though, is archived forever in the photograph of newly re-elected President Harry Truman holding up a copy of the Chicago Tribune on election day 1948 and smiling under the headline "Dewey Defeats Truman." Thousands of teachers from Chicago and beyond rallied at a Near West Side park Saturday as lawyers labored into the night at a Loop office to turn a framework for a new contract into finer points that can become a deal. Parents can expect to wait until Sunday afternoon or later to find out whether their children will return to class Monday morning after missing a week of school because of the Chicago Teachers Union strike. Hundreds of union leaders are scheduled to meet at 3 p.m. Sunday for a potential vote that could end the walkout. While attorneys talked terms in private, the Saturday afternoon rally was filled with symbolism. Out-of-state teachers traveled to Union Park in solidarity with a city teachers union that has attracted national attention as organized labor looks for lessons in a fight with cash-strapped government. "I remember in Baltimore, we had a 95 percent strike, but it didn't look like this," Johnson said, referencing the 90 percent support Chicago's strike vote got. "You have proven to the world that you're not going to take it anymore. "The challenge was to stand up for the children, and you have done that." Union officials on Friday hoped for as many as 50,000 to show their support Saturday. Instead, a crowd that police put at 2,500 jammed into a corner of the park to chant, shout and march in support of a strike they say is about securing the best learning conditions for students. The smaller turnout was perhaps indicative that the union's agreement to a framework with the district — paired with a long week of picketing — left many teachers deciding to stay home. Chicago Teachers Union President Karen Lewis kept the rhetorical pressure on, however, seeking to avoid losing leverage as details are hammered out. Lewis energized the crowd by saying she wanted the air conditioning turned off at CPS headquarters and Rahm Emanuel's City Hall office so they could work in the same conditions as some of the city's teachers and students. Then Lewis offered a warning in advance of an anticipated House of Delegates vote Sunday in which members could opt to end to the strike and start a process to approve a contract. "A woman came up to me and said she got a text from her principal telling her faculty to report to work tomorrow and Monday to prepare their rooms, and what I want to tell you is, we're still on strike," Lewis said as the crowd cheered. "We have the framework for an agreement. We don't have an agreement. So, until you hear it from CTU ..."
"It's not true!" teachers shouted back. The atmosphere resembled that of a street festival, with families and friends posing for photos and a marching band parading through the park. Before speakers took the stage, Paul Mulchrone, a music teacher at Carter Elementary in the Washington Park neighborhood, sat on a blanket under a tree with his three children. "We're striking for a fair contract, but we're also using this strike to send a message," said Mulchrone, who added that he had been picketing and knocking on doors in his school's neighborhood all week. "If you want us to improve test scores or however you measure it, then we need the resources and we need (the city) to invest in the schools." The Chicago rally came a day after a Wisconsin judge struck down nearly all of a law pushed by Republican Gov. Scott Walker that would have ended collective bargaining rights for most public workers in that state. "Greetings of solidarity from Wisconsin, from the state where teachers led the fight against Gov. Walker to the city where teachers are standing firm against Rahm Emanuel!" Bob Peterson, president of the Milwaukee Teachers' Education Association, shouted from the stage. "Walker and Emanuel are two sides of the same pro-corporate, pro-privatization agenda." Afterward, some of those in attendance marched a little more than two miles west to Garfield Park. On Sunday, union leaders have the task of selling the deal to members, many of whom have rallied for months over double-digit salary increases for working a longer school day and getting better school conditions. Lewis upset some delegates Friday by declining to share details of the contract framework. Late Saturday, the union issued a news release that spelled out some of them. The union says it will be a three-year contract, with an option for a fourth year that both the district and union would have to agree to. There would be a 3 percent raises in years one and four, and 2 percent raises in years two and three, according to the union. So-called step and lane increases, raises given out for years of service and continuing education, would be preserved under the contract, according to the union. The union also said it had come to an agreement on the sticky issues of teacher recall when schools close and performance reviews. Standards for teacher evaluations that could lead to firings would be eased, and some higher-rated teachers could get a better shot at being recalled after layoffs, sources said. The mayor did get the longer school day he fought so hard to achieve, though six of 181 days in school became half days during negotiations, sources said. And principals will still have significant power in hiring teachers, they added. A vote to end the strike would cap a week of demonstrations that included pickets of schools across the city and outside the offices of aldermen who opposed the strike; rallies of thousands of teachers and supporters who encircled City Hall and brought Loop traffic nearly to a halt; and negotiating sessions that sometimes began one morning and extended into the wee hours of the next. During the week, Emanuel was called a bully and a liar by teachers, Lewis was verbally reprimanded by district officials for describing negotiations as "silly," and pundits across the nation weighed in. The strike drew widespread attention because it highlights prominent issues such as the changing status of teachers unions and efforts to reform public education. Politics also came into play: Emanuel is a former chief of staff to President Barack Obama, and the strike is in the president's hometown. As all of that played out in public, negotiators were battling behind closed doors over raises, how teachers are evaluated and the process under which they could be rehired if they are laid off when schools close or consolidate. What remains to be seen, even if the strike ends Sunday, is how the agreement affects future relations between the union and mayor as the board struggles to find ways to afford the new raises, faces a projected $1 billion deficit in the 2014 school year and contemplates scores of school closings. Money can be saved over the long run by closing schools or enrolling more students in privately run charter schools, which generally operate at lower costs and often receive outside funding. The contract blueprint "doesn't limit the growth of charters, or the closure or consolidation of existing schools that will have to take place down the road," said Ald. Patrick O'Connor, 40th, the mayor's City Council floor leader. I'm insulted that the Tribune is publishing this crap considering the Delegates haven't even seen the contract yet. It is premature to assume there will be school tomorrow. We need to see it, read it and debate the issues. The board had 11 months to negotiate a fair contract. Their actions led to this striike. It is unfair to rush CTU into an agreement without everyone having a fair amount of time to read what is proposed. If CPS wanted a contract sooner they would have negotiated in good faith months ago. I for one will not vote on anything until I've read every word. My grandfather was an attorney and he taught me well. Never sign anything you have not completely read. We owe that to our students, parents, collegaues and community members who have supported us as we fight for equitable public education for all children.